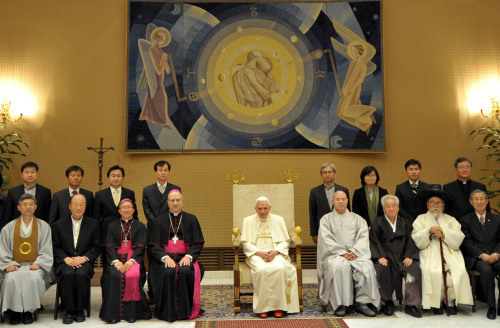 Korean religious leaders met Pope Benedict XVI on Wednesday to exchange views on promoting inter-faith harmony with the Vatican, according to Yonhap News Agency. The Korean Council of Religious Leaders, comprising representatives of Buddhism, Catholicism, Confucianism and Protestantism, visited the Vatican as part of their Christian pilgrimage from Dec. 6-16 to Jerusalem and Bethlehem. It is the first time the leaders of the Korean faith communities made a group visit to a pope, the council said in a press release. The visiting representatives include Kim Joo-won, general director of Won-Buddhism; Rev. Rhee Kwang-sun of the Christian Council of Korea; Hyginus Kim Hee-joong, archbishop of Gwangju; Ven. Jaseung, head of the Jogye Order of Korean Buddhism; Choi Gun-duk, president of Sung Kyun Kwan; and Han Yang-won, president of the Korean Council of Religious Leaders. “The Vatican showed keen interest in the fact that Korean religious leaders jointly went on a pilgrimage to the Holy Land,” the council said in a press release. They also met with senior Vatican leaders including Archbishop Pier Luigi Chelata and exchanged views on ways of promoting inter-faith peace.